The night you pick up your CSA share consider establishing pizza night. The idea is that you plan on supper being a hands-off, household favorite that everyone enjoys. Your pizza night could be as simple as a frozen pizza. You could go out to your favorite Tex-Mex place. Pick up barbecue sandwiches. Or order in Chinese food. Here’s the reasoning behind this cunning plan. First, it’s Pavlovian. If members of your household are ambivalent or even hostile towards the CSA idea, it can’t hurt to have them associate the arrival of your share with a favorite meal. Turn plastic bags inside-out before putting veggies back in them. Many items, like greens or summer squash, will be moist from hanging out in plastic bags. If they are really wet, spread them out on a towel to dry while you handle other things. Know where veggies go. Many fruits and veggies don’t want to be in the fridge. Here’s a handy reference for what should go where. Got herbs? 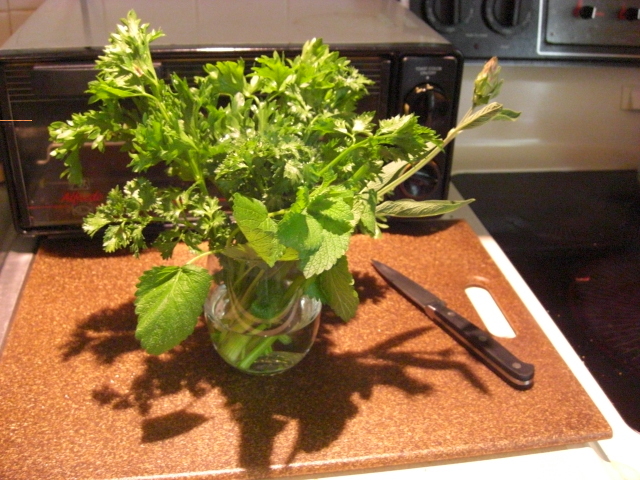 Make an herb bouquet. Wash the herbs and let them dry. (If you need to speed things up, you can pat or spin them dry.) Then trim the ends and stand them up in a little glass of water. Cover the herbs and glass with a plastic bag and store in the fridge. They’ll last a lot longer this way. And they are washed and ready to be chopped when you need them. Make some meal plans. There’s nothing like handling produce to get ideas for what you want to do with it. Sort. With pre-packaged conventional produce, it’s easy to forget that vegetables naturally come in different sizes. For example, you might want to sort green beans. Slender ones are great blanched and sautéed. Larger ones can be simmered Southern-style. Start prepping. You may not want to chop or peel something unless you have a specific meal in mind. 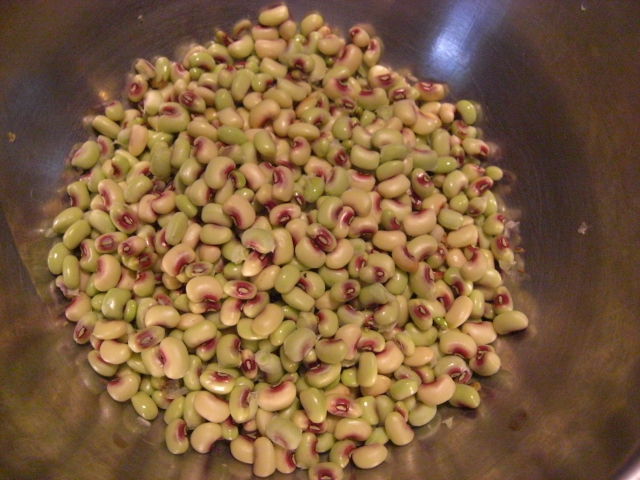 But you know, for instance, that the beans need stringing and the peas need shelling. 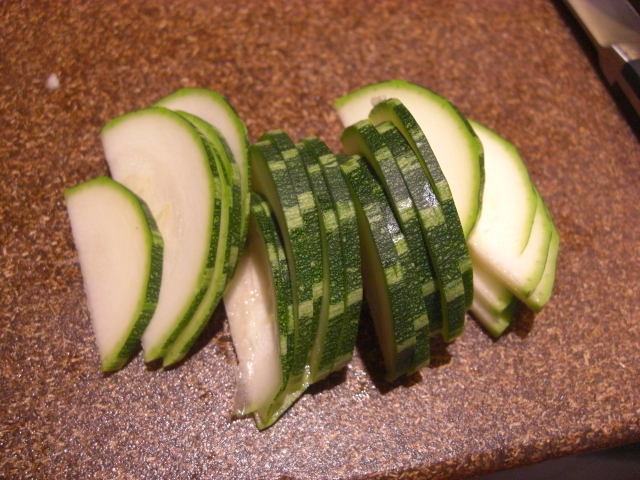 On the other hand, if you know you’re going to make a dish in the next couple of days that calls for, say, thinly-sliced zucchini, why not get it done? If you’ve got the time and energy, do it sooner rather than later. If that dish doesn’t pan out, you can Google something else to do with thinly-sliced zucchini. Plan and prep snacks. Have celery and carrot sticks waiting in the fridge and frozen fruit in the freezer. Know where the apples are. 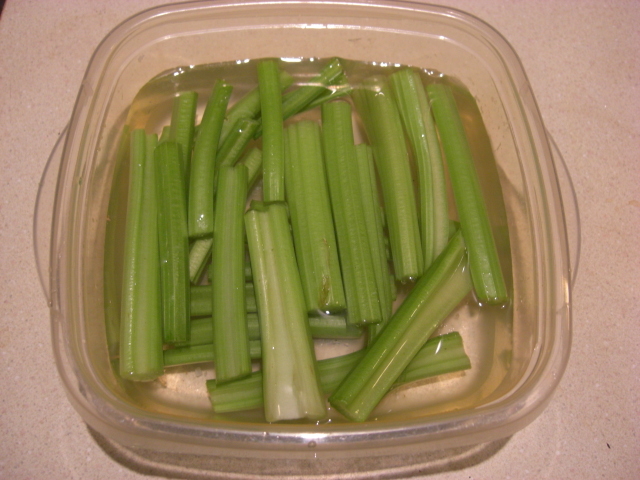 Chop celery sticks and store in water in the fridge for a crunchy snack. 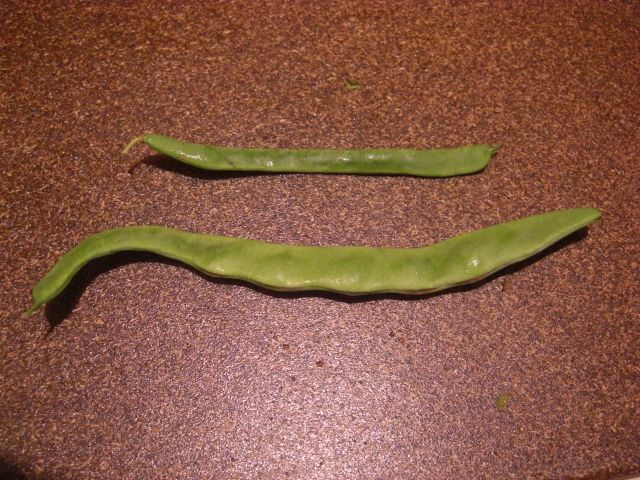 Shelling field peas is not intrinsically fun. My husband is fond of our CSA share now, so we don’t always have pizza night. Sometimes we have reheated leftovers instead. But even now, I never cook on Wednesdays so I have time to manage our share as a whole. It’s one of my executive responsibilities as CFO – Chief Food Officer.